Blanchester Mason John Hill helps prepare a racer for his downhill run. Clockwise from left are event emcee Charlie Hargrave, Blanchester Police Chief Scott Reinbolt, Clinton County Commissioner Brenda Woods, and holding the first-place trophy is racer Jace Lawson, who won the 10-13 age bracket of the 2018 Soap Box Derby. 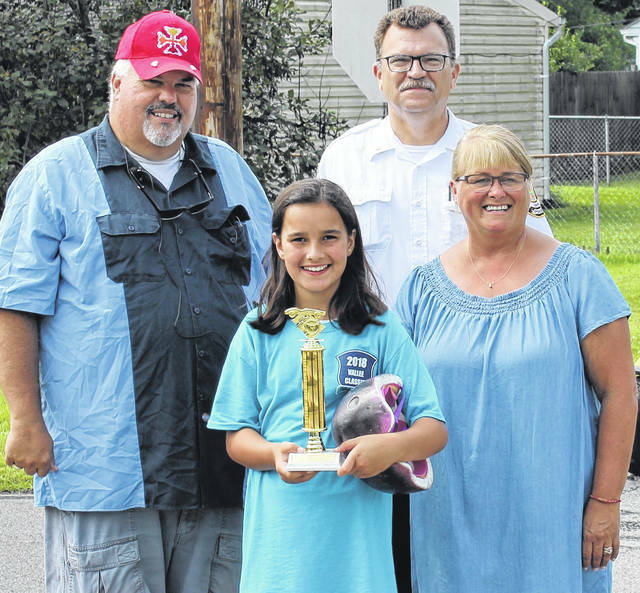 The Blanchester Police Department’s “Vallee classic” soap box derby was held Saturday, Aug. 11 and drew about 20 local youngsters ages 6 to 13 to race in the event. The winner in the ages 6-9 bracket was Gunner Wolf, while Jace Lawson was the winner in the 10-13 group. Spectators of all ages lined the race course throughout the day. The event was financed by the Citizens for Adequate Policing Trust Fund. The Master of Ceremonies for the event was local disc jockey Charlie Hargrave. Public officials in attendance were Clinton County Commissioner Brenda Woods, Assistant Clinton County Prosecuting Attorney Andrew McCoy and Blanchester Village Councilman Chad Hollon. The event was a police/community partnership, with the Calvary Baptist Church hosting the event on their grounds, members of the Blanchester Masonic Lodge helping staff the event, Hollon Towing helping to get the race ramps in place, Tylermade Remodeling helping with preparing the ramps and Curless Printing and BDK Feed donating time and material. “We are grateful to all of those who helped with the event, those parents and grandparents who helped their youngsters build cars and to all of the young citizens who were brave enough to run the course. 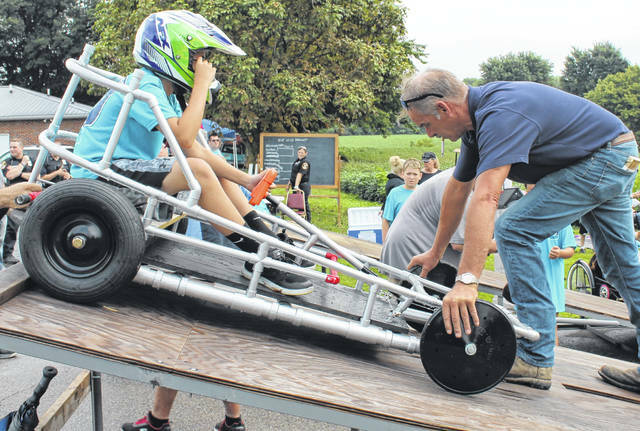 We plan to hold another soap box derby next summer,” stated Blanchester Police Chief Scott Reinbolt.